In a steamer set over rapidly boiling water, blanch the potatoes for 11 to 13 minutes, until the tines of a fork will just pierce the top ¼ inch of the surface. Drain and rinse under cool water to stop the cooking. Cut each potato in half crosswise, and score the cut side of each with the tines of a fork. Preheat the oven to 375 degrees and place a large rimmed baking sheet on a rack in the lowest position. Combine the potatoes, olive oil, salt, pepper, and oregano in a large bowl and toss together until evenly coated. Transfer the potatoes to the hot baking sheet and jiggle the pan to distribute them evenly. Roast, turning the potatoes with a metal spatula every 10 to 12 minutes, for about 30 minutes, until very crisp and golden. While the potatoes are roasting, heat a large nonstick or cast-iron skillet over medium-high heat. Add the chorizo half-circles and brown, turning occasionally with tongs, until golden and slightly crisp, about 5 minutes. Remove from the heat. 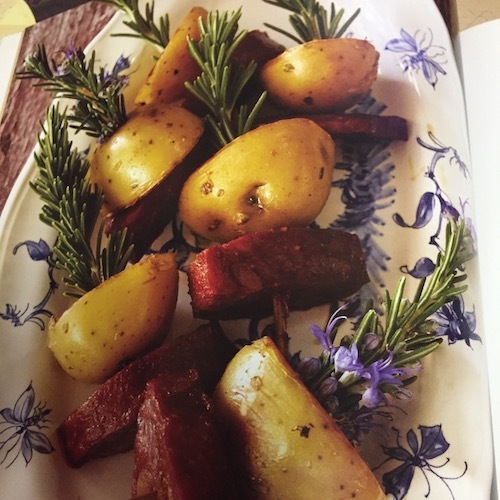 When cool enough to handle, place a slice of chorizo on top of each roasted potato half and secure with a toothpick or a partially stripped rosemary stem. Place the skewers on a platter and squeeze a little lime juice over the top before serving. Makes about 40 bites. In a medium mixing bowl combine mustard, soy sauce, garlic, rosemary, Tabasco and black pepper. With a small whisk, incorporate the olive oil, drop by drop, until you have a smooth emulsified sauce with a consistency similar to mayonnaise. 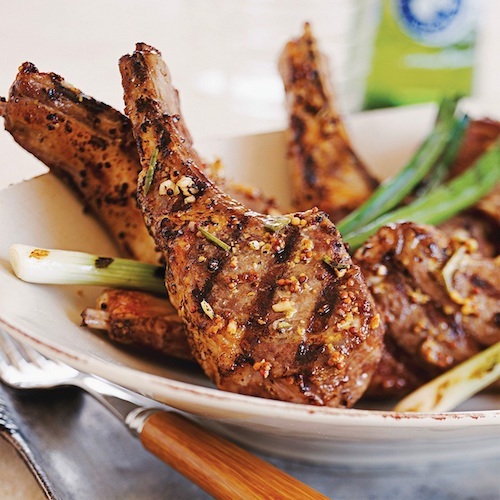 Generously coat both sides of the lamb chops with the mustard mixture and set aside, refrigerated, for at least ½ hour and up to 2 hours. Over a medium-hot grill, cook the lamb for about 5 minutes on each side for medium rare. Remove from grill and brush with a little more of the mustard sauce if desired. For a more pourable sauce, thin by whisking in a bit of warm chicken stock. These “twice baked” Italian cookies are much easier to make than most people think. They are meant to be dipped into coffee or a dessert wine (such as Vin Santo or “holy wine”). We demonstrate this recipe quite often at our very popular classes focusing on the foods of Italy, especially the region of Tuscany. Turn out the dough onto a clean lightly floured countertop. Using hands, knead dough for about 1 minute. Divide the dough into 4 equal portions. Using the palms of your hand, roll each portion into a log about 12-inches long and 1-inch in diameter. Transfer logs to a 12-x15-inch baking sheet lined with parchment paper (or greased with butter) by placing crosswise on the sheet and spacing them about 2-inches apart. Using the palm of one hand, lightly flatten the top of each log until it is about ½-inch thick. Set aside. Using a pastry brush, paint logs with the remaining lightly beaten egg and sprinkle with sugar. Place logs in the oven and bake for 15 to 20 minutes or until golden brown. Remove from the oven and let cool on the baking sheet for about 10 minutes or until they can be safely handled. (Leave oven set at 350 degrees.) Transfer logs to a clean cutting board. Using a sharp knife, cut each log crosswise on the diagonal into ½-inch wide pieces. On a second baking sheet lined with parchment paper, transfer biscotti’s, cut side down, on the sheet. Place in oven and continue to bake for another 10 minutes or until lightly toasted and the edges are golden brown. Remove from oven and allow to cool on the baking sheet for 10 minutes or until completely cooled. 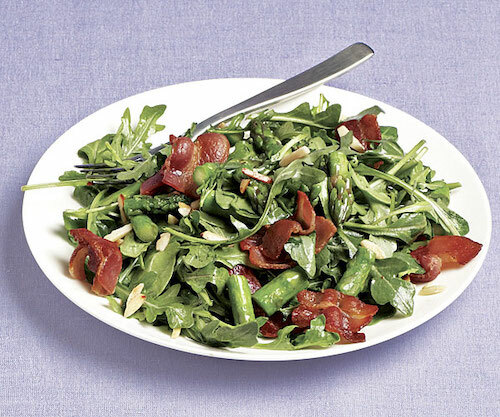 Serve immediately (or store in a covered container at room temperature for up to 2 weeks). Makes about 3 dozen biscotti. ETC: Add a touch of coffee shop elegance by dipping the ends of these cookies into melted dark chocolate to which a bit of butter or shortening has been added. Use the best dark chocolate you can afford.